Try our Genuine Ruby Carvings Satisfaction Guarantee - compare our prices and our superior quality. 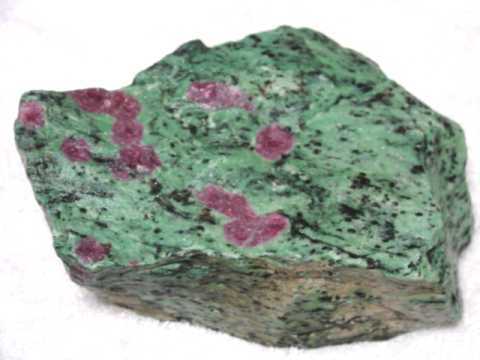 Click on any natural ruby in zoisite matrix carving image below to enlarge it. This 14k yellow gold pendant is set with a natural ruby gemstone with very beautiful deep red color under incandescent light as shown in the photo at left. It will make a wonderful ruby necklace! This ruby gem was faceted from a natural ruby crystal that was mined in Burma in 2004. It is lightly included with some natural silky inclusions in some areas (GIA: Type II Gem: Clarity Grade VS). set with 34 carats of sapphire cabochon gems! This large pendant was handcrafted in sterling silver and set with three oval shaped cabochon gems of natural reddish-purple sapphire measuring 10x8mm, 12x10mm, and 16x12mm. These natural color sapphire cabochon gems are translucent, and they have beautiful reddish-purple natural color under incandescent light as shown in the photo at left. These 3 natural sapphire cabochon gems weigh 34 carats total weight! pendant measures 3.0" long x 0.8"
This extra large size star sapphire pendant was handcrafted in sterling silver and set with three cabochon gems of natural color grayish-reddish-purple star sapphire measuring from 11x13mm up to 14x17mm. These three natural star sapphire cabochon gems have fairly well developed natural 6-ray stars. The photo at left was taken under incandescent light. This beautiful star sapphire ring was handcrafted in sterling silver and set with a natural color grayish-purple star sapphire cabochon gemstone. This genuine star sapphire gem has a fairly well developed 6 ray star. It measures 13mm in diameter and weighs 16 carats. The photo at left of this untreated star sapphire ring is viewed under incandescent light. adjustable ring size fits size 7" to 8"
This genuine star sapphire ring was handcrafted in sterling silver and set with a natural star sapphire cabochon gemstone measuring 16x14mm and weighing 21 carats! This untreated star sapphire gemstone has dark grayish-reddish-purple natural color and a fairly well developed natural 6 ray star. The photos at left are viewed under direct sunlight. This G I A Certified oval cut ruby gemstone weighs 1.22 carats. See another view of this genuine ruby jewelry. Also, see a close-up top view of this genuine ruby jewelry. 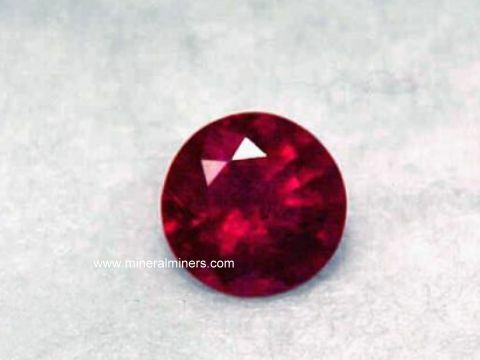 It has no eye visible inclusions (completely eye-clean) (GIA: Type II, extra fine) It has a medium deep red color with a very slight purplish modifier. The photo at the left was taken under a combination of florescent and incandescent lights. This genuine ruby gemstone was faceted from a natural ruby crystal that was mined in Mozambique Africa. Under high magnification it shows minute crystal inclusions of which there is some indication of possible low heat treatment, (No other treatment to this gem). Our mineralminers.com Special Offer Price for this exceptionally fine genuine ruby set in a fine 14K white gold pendant is $1928.00, total price. The GIA Certificate will be included. Faceted from a genuine ruby crystal mined and fashioned in Sri Lanka ( Ceylon ). This G I A Certified oval cut ruby gemstone weighs 1.71 carats. See another view of this genuine ruby jewelry. This gem is exceptionally clean, it has no eye visible inclusions (completely eye-clean) (GIA: Type II, eye-clean), extra fine. 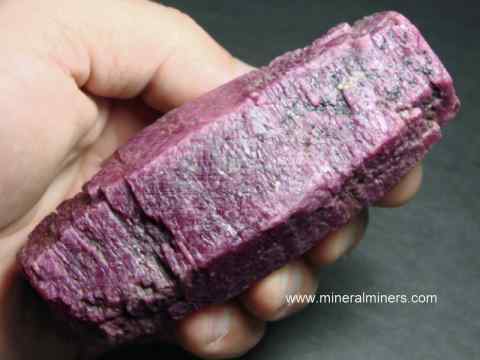 It has a beautiful purple red color of medium deep tone. The photo at the left was taken under incandescent lights. This genuine ruby gemstone was faceted from a natural ruby crystal that was mined and fashioned in Sri Lanka. Under high magnification it shows a minute crystal inclusion of which there is some indication of possible low heat treatment, (No other treatment to this gem). Our mineralminers.com Special Offer Price for this exceptionally fine genuine "Ceylon" ruby set in a fine 14K yellow gold pendant with an E, VVS 0.05 Carat diamond is $3540.00, total price. The GIA Certificate will be included. 62 carats total weight star sapphire gemstones! Genuine star sapphire pendant measures 3.1" long x 0.8"
This extra large size star sapphire pendant was handcrafted in 925 sterling silver and set with three cabochon gems of natural color grayish-purple star sapphire measuring from 12mm in diameter up to 17mm in diameter. These three natural star sapphire cabochon gems have well developed natural 6-ray stars! The photo at left was taken under incandescent light. This unique star sapphire pendant was handcrafted in 925 sterling silver and set with a cabochon gem of natural color purple star sapphire measuring 20mm in diameter. This natural star sapphire cabochon gem has a very well developed natural 6-ray star when viewed under direct sunlight. The photo at left was taken under direct sunlight. See also another view of this genuine star sapphire jewelry design under office lighting. This pair of genuine ruby earrings is set in 14k yellow gold studs. These genuine ruby gemstones are totally clean to eye clean (GIA: Type II Gem: Clarity Grade eye-clean), and they have very fine red color with very good brilliance. They were faceted from natural ruby crystals in Thailand. They were carefully heated, and under magnification they show natural minute inclusions which absolutely guarantee their natural origin. This pair of genuine ruby earrings is set in 14k white gold studs. These lovely ruby gemstones are lightly included (GIA: Type II Gem: Clarity Grade SI/VS), and they have very beautiful red color under incandescent light as shown in the photo at left. These genuine rubies weigh just over 1/2 carat each, and they are very well faceted from natural ruby crystals that were mined in Mozambique. They were carefully heated with no other treatments (heat only) and they have natural inclusions which absolutely guarantee their natural origin. See also a side view of these genuine ruby earrings. This pair of dark ruby earrings is set in 14k white gold studs. These genuine ruby gemstones are lightly included (GIA: Type II Gem: Clarity Grade SI), and they have beautiful dark red color with flashes of rich red inside under bright incandescent light as shown in the photo at left. These genuine rubies are very well faceted from natural ruby crystals that were mined in Mozambique. They were carefully heated with no other treatments (heat only) and they have natural inclusions which absolutely guarantee their natural origin. This pair of genuine ruby earrings is set in 14k yellow gold studs. These beautiful ruby gemstones are lightly included (GIA: Type II Gem: Clarity Grade SI/VS), and they have very beautiful bright red color. These genuine rubies were very well faceted from natural ruby crystals that were mined in Mozambique. They were carefully heated with no other treatments (heat only) and they have natural inclusions which absolutely guarantee their natural origin. See also a side view of these genuine ruby earrings. This pair of genuine ruby earrings is set in 14k yellow gold studs. These genuine ruby gemstones are lightly included (GIA: Type II Gem: Clarity Grade SI), and they have beautiful bright red color with flashes of rich red inside under bright incandescent light as shown in the photo at left. These genuine rubies are very well faceted from natural ruby crystals that were mined in Mozambique. They were carefully heated with no other treatments (heat only) and they have natural inclusions which absolutely guarantee their natural origin. This ruby ring was handcrafted in sterling silver and set with a 14x12mm rectangular shaped natural ruby in zoisite cabochon gem that was hand-ground & polished from natural ruby in zoisite rough mined in Tanzania, Africa. This ruby ring was handcrafted in sterling silver and set with a 26x13mm cabochon gem of natural ruby in zoisite that was hand-ground & polished from natural ruby in zoisite rough mined in Tanzania, Africa. This ruby ring was handcrafted in sterling silver and set with a 25x14mm free-form shaped natural ruby in zoisite cabochon gem that was hand-ground & polished from natural ruby in zoisite rough mined in Tanzania, Africa. This natural color ruby ring was handcrafted in 925 sterling silver with an open back setting. This natural color ruby ring is bezel set in 925 sterling silver with an open back setting. The 15x11mm oval shaped ruby was handcrafted from a thin flat natural tabular ruby crystal. The upper and lower surfaces are the original natural surfaces of the ruby crystal! See a photo showing light reflecting from the terminated crystal surface in this genuine ruby ring. This untreated ruby has very rich reddish natural color - it is unheated and untreated. See also a side view of this natural ruby ring. This natural color ruby ring was handcrafted in 925 sterling silver with an open back setting. It is set with a natural tabular ruby crystal measuring 20mm long x 15mm wide. All surfaces are the original natural surfaces of the ruby crystal! See a photo showing light reflecting from the terminated crystal surface in this genuine ruby jewelry design. 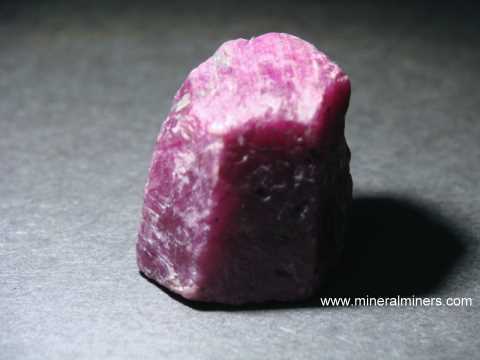 This untreated ruby has pinkish reddish natural color - it is unheated and untreated. See also a side view of this natural ruby ring. This beautiful star ruby ring was handcrafted in sterling silver and set with a 14mm round natural star ruby cabochon gemstone. This unheated and untreated star ruby gemstone has rich reddish-pink natural color and a fairly well developed 6 ray star under direct sunlight. The photo shown at left of this genuine star ruby ring is viewed under incandescent light. This natural color star ruby ring was handcrafted in sterling silver and set with a natural star ruby cabochon gemstone measuring 10mm in diameter. This unheated and untreated star ruby gemstone has very rich purplish-reddish natural color and a fairly well developed 6 ray star under direct sunlight. The photo of this genuine star ruby ring shown at left is viewed under incandescent light. See a side view of this natural ruby jewelry design. See also a photo showing the natural 6-ray star in this genuine star ruby ring. 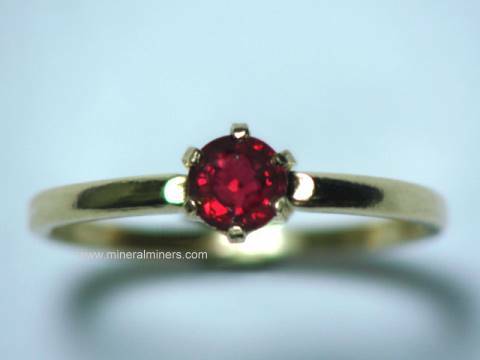 This 14k yellow gold ring is set with a natural ruby gemstone with very beautiful deep red natural color. This ruby gem was faceted from a natural ruby crystal that was mined in Mozambique, and it is unheated and untreated. It is only very lightly included (GIA: Type II Gem: Clarity Grade VS). See also a side view of this genuine ruby ring. This beautiful ruby and diamond ring was casted in 14 K Yellow gold and set with four (4) natural round shape, deep red, faceted rubies weighing .48 carat, and five (5) round brilliant cut diamonds weighing .50 carat. The total gem weight in the ring is 0.98 carat. The diamonds are all eye clean and white and the rubies are eye clean and very slightly purplish red. This beautiful ruby and diamond ring was crafted in 14 Yellow gold and set with a natural oval shape, deep red,(very slightly purplish) faceted "gem" ruby measuring 6.1 x 4.0 x 3.9mm weighing 0.89 carat, and two (2) side accent, full cut diamonds weighing 0.03 carat total. This natural untreated center red ruby gemstone is one of the rare, transparent, red gems that is eye clean and contains only minute natural crystal inclusions seen only with back-lighting and a trained eye. On the surface of one of the crown facets a tiny crystal inclusion reaches the surface and appears as a spec under magnification. The ruby was mined and faceted in Sri Lanka (Ceylon), and is set in this ring in a white gold bezel. The ring is a size 6. See also a side view of this genuine ruby jewelry design. This beautiful three ruby ring was crafted in 14 K rose gold and set with three (3) natural round shape, deep red, faceted rubies weighing 1.26 carats in total weight. 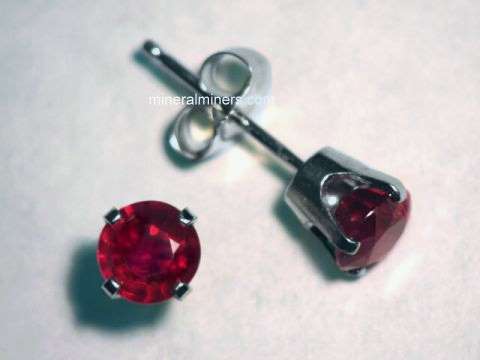 The rubies are natural non treated, well matched, (at 4mm each) and totally eye clean with bright red color. Each ruby is framed with a single row of pink sapphires that weigh 0.23 carat in total weight. The size of this ring is 7. See also a top angle view of this ruby jewelry design. This beautiful ruby ring was crafted in 14 white gold and set with a natural marquise shape, deep red,(very slightly purplish) faceted "gem" ruby measuring 6.1 x 3.2 x 3.0mm weighing 0.38 carat. This natural untreated marquise shaped red ruby gemstone is one of the rare, transparent, red gems that is completely eye clean and contains only minute natural crystal inclusions seen only with back-lighting and magnification. The ruby was mined and faceted in Sri Lanka (Ceylon), and is set in this ring in a six prong setting. The ring is a size 6 1/2. This beautiful ruby ring was crafted in 14 K Yellow gold and set with three (3) natural round shape, deep red, faceted rubies weighing .39 carat in total weight. The rubies are well matched and eye clean with bright red very slightly purplish color. The size of this ring is 9 1/2. Item rbyj118ee: this natural color ruby bead necklace is 18 inches long with 41 carats of genuine ruby beads that are gradational in size ranging from 2.25mm at the clasp up to 3.25mm at the largest diameter in the center of the necklace, and then back down to 2.25mm again. Please see below to order this genuine ruby necklace. This natural color ruby pendant is bezel set in 925 sterling silver with a solid back setting. The 16x13mm natural ruby is a thin flat tabular hexagonal ruby crystal. The surfaces are the original naturally terminated surfaces of the ruby crystal! 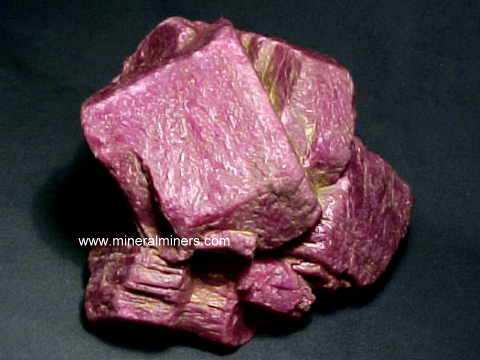 This untreated ruby has very rich reddish natural color - it is unheated and untreated. This natural color ruby pendant is bezel set in 925 sterling silver with a solid back setting. 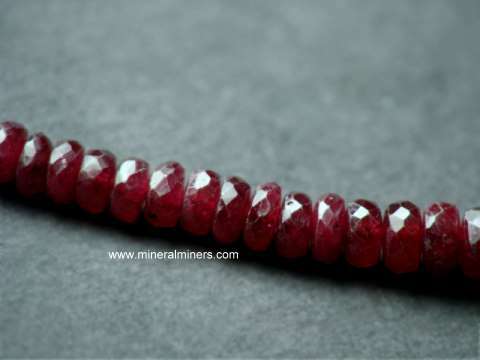 The 18x16mm natural ruby is a thin flat tabular hexagonal ruby crystal. The surfaces are the original naturally terminated surfaces of the ruby crystal! 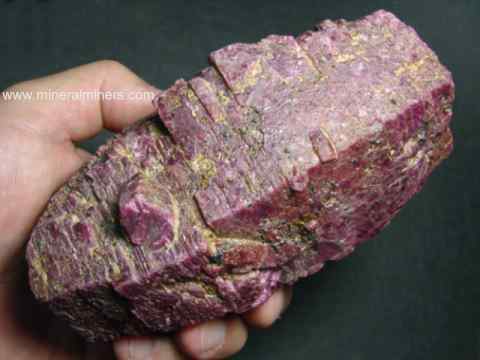 This untreated ruby has very rich reddish natural color - it is unheated and untreated. This natural color ruby pendant is bezel set in 925 sterling silver with a solid back setting. The 20x20mm hexagonal tabular ruby crystal is completely natural. The surfaces are the original naturally terminated surfaces of the ruby crystal. 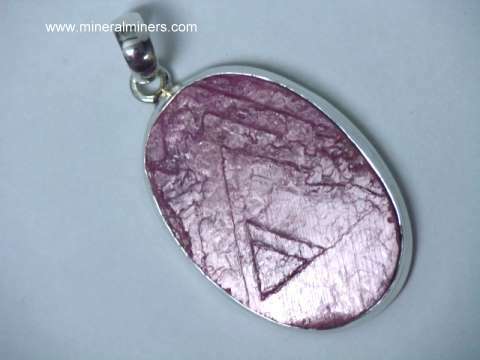 There are natural triangular markings on the upper surface of this thin flat tabular ruby crystal. 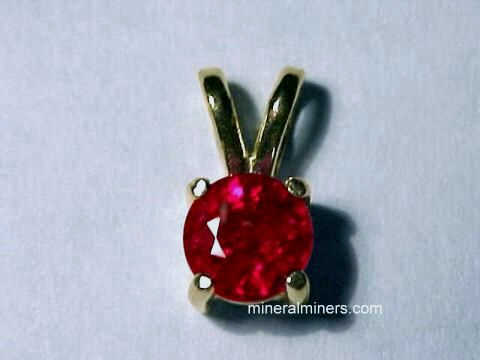 See a photo showing light reflecting from the natural upper crystal surface in this genuine ruby crystal pendant. This untreated ruby has very rich reddish natural color - it is unheated and untreated. This natural color ruby pendant is bezel set in 925 sterling silver with an open back setting. The 18x17mm drop shaped ruby was handcrafted from a thin flat natural tabular ruby crystal. The upper and lower surfaces are the original naturally terminated surfaces of the ruby crystal. This untreated ruby has very rich reddish natural color - it is unheated and untreated. This natural color ruby crystal necklace is bezel set in 925 sterling silver with open back settings. The drop shaped rubies were handcrafted from thin flat natural tabular ruby crystals. The upper and bottom surfaces are the original naturally terminated surfaces of the ruby crystals. See a photo showing light reflecting from some of the natural upper crystal surfaces in this genuine ruby jewelry design. 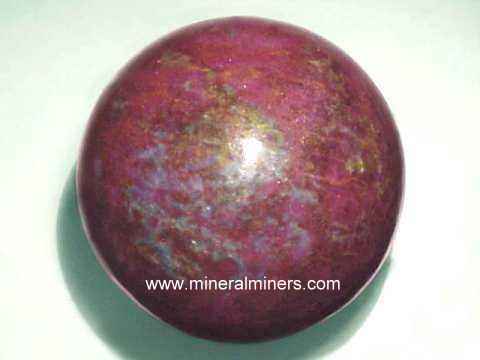 This untreated ruby has very rich reddish natural color - it is unheated and untreated. See also a full view of this natural ruby necklace. This natural ruby in zoisite pendant was handcrafted in 925 sterling silver and set with a 41x24mm ruby in zoisite cabochon gem. This beautiful ruby pendant includes a sterling silver chain necklace 18 inches long, and it is included at no extra charge. The gem in this ruby necklace was hand-ground & polished from natural ruby in zoisite rough mined in Tanzania. 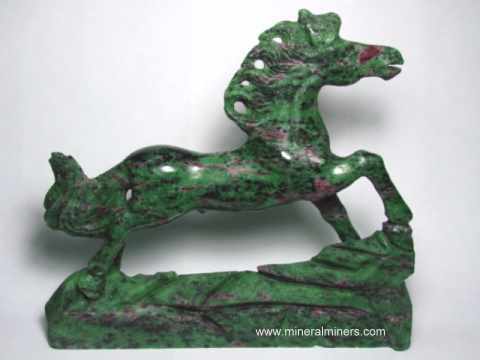 Our handcrafted Ruby in Zoisite Matrix Sculptures are unheated and untreated. See also our page displaying Genuine Ruby Gemstones, and our naturally terminated Ruby Crystals. See our genuine ruby rings, ruby necklaces and ruby earrings. We also have a separate page displaying all of our genuine Ruby Jewelry designs. To see photos of another mineral variety, select any link from our Mineral Inventory & Factsheet Index. To see more natural ruby photos, just select another ruby link shown below. 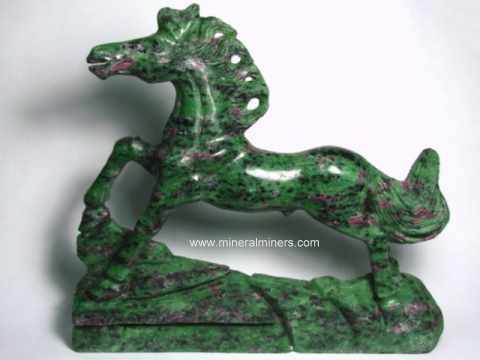 Would you like us to inform you when we add more hand carved natural ruby in zoisite matrix sculptures on this page? We do have additional ruby carvings in stock at our mineral warehouses, so be sure to let us know if you have any natural ruby sculpture special requests.